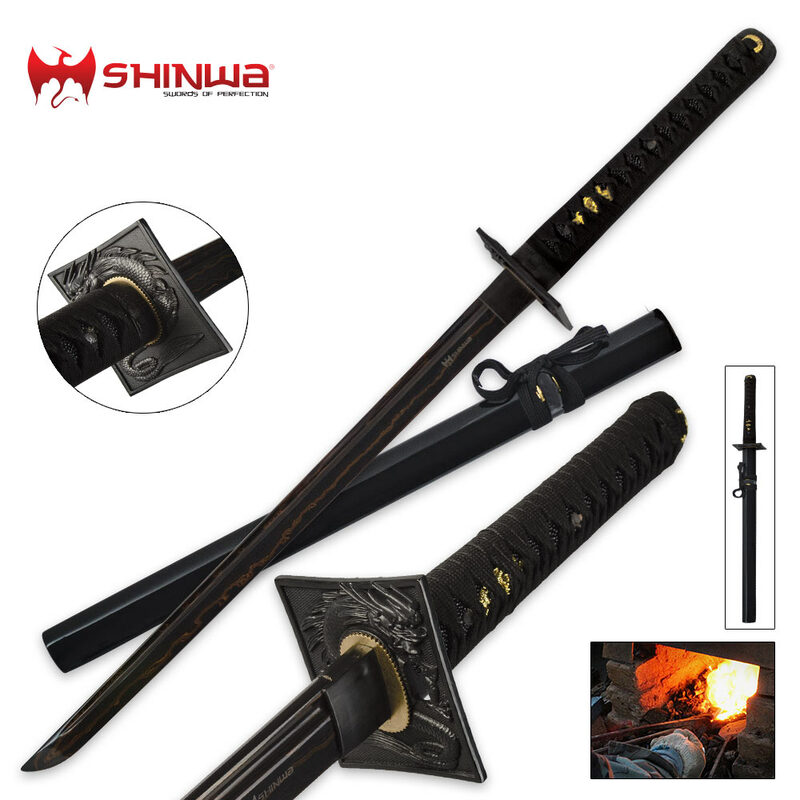 Shinwa Black Knight Damascus Wakizashi Sword | BUDK.com - Knives & Swords At The Lowest Prices! Enjoy the legendary quality of Shinwa in this brand new Black Knight Damascus Wakizashi. 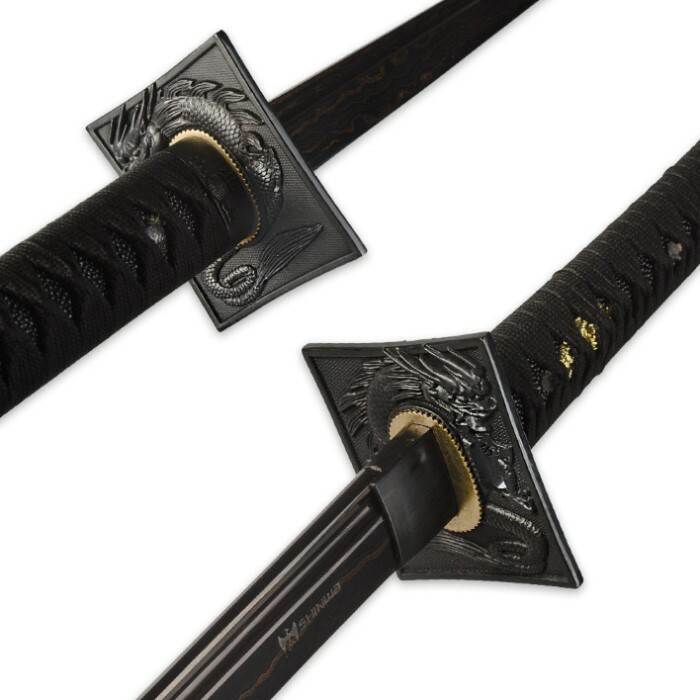 Each one is hand forged by master Shinwa swordsmiths with unrivaled craftsmanship and precision. The thick, hefty blade is crafted of Damascus steel with striking patterns and a deep blood groove. Custom details abound, including a cast dragon tsuba, brass-plated menuki, and faux ray skin and cord wrappings on the handle. A coordinating lacquered hardwood scabbard houses the handsome 20 1/2" Damascus blade. This is a pretty cool little sword. Everything is tight. Nothing is loose. No rattle. Blade is beautiful. All black with little copper lightning bolts running up and down the blade. Semi sharp but I can fix that. Only problem is the scabbard. It's full of wax! The blade get covered in it every time I put it away. Also, it barely fits in it's scabbard. Super tight. At least it won't fall out on its own. Overall, nice new piece for my collection. I have it resting on a single sword stand above my dresser. Looks great. Thanks BudK! Just opened: one minor but noticeable issue. A loose splinter of steel along the edge where it was either warped and baldy patched or just neglected during packaging. However, the construction overall is very solid and well arranged. For the price this blade is a steel (get it?). I can overlook minute blemishes. Kudos BudK! First lets remember this is a 50 dollar sword before I go any farther. Now keeping that in mind, the sword very nice, fit and finish good, tight with no rattle, balance is nice, saya is tight almost too tight but I'm sure it will work in. The "Damascus" is nicely done, not too much of the reddish color which I could do with out. I would call this a technically functional fantasy piece., moderately sharp, which could I believe be used for light cutting, but over all I feel it is best as a display piece. overall very nice for the price. I've always been a fan of cheesy Ninja films so this is a nice addition to my collection. Sword was sharp out of the box. Should have bought two. During deer season while skinning a deer i wanted to see just how good this blade is. Cut clean through the bone knicked the blade a bit but cut through it. I'm sure every sword is a little different but mine was black and red bent the blade a bit but I bent it back and got the blade back to somewhat what it was. Wish I would have gotten another though for display. It is/was a beautiful blade. The product looks nothing like the pictures on this website. The sword I received is over 80% orange. I wouldn't care about this, but it was a gift for someone who liked the black and it looks cheesy. Other than the deceptive pics, the Saya(sheath) is loose and filled with a white material that smears on the blade when you sheath it. I've seen this complaint on trueswords as well. The blade is sharp at least and the tang seems solid. I wish the sword was $100 and the issues were handled. Can I rate my Shinwa a "6?" This is beyond what I wished for when I was a teen! When I was a active MA practitioner, I dreamt of one day having the 1000's of $ needed to commission a ninjato with a Damascus blade. What was beyond me was the idea that a black Damascus blade with incredible workmanship my Shinwa blade has and the dragon tsuba is great touch. Michionne would be jealous ?? One of the best swords I've ever purchased! Damascus means nothing unless you know which steels were folded together. With that said I have no idea what the true quality of this sword is. Without any test cutting my guess is thats its made from relatively low grade 1045 carbon steel at best, based solely on the $80 price mark alone. What I can tell you for sure is that this is a full tang sword, it'n not super cheap stainless steel, and it certainly looks and feels great. All of the fittings are tight and there is no rattle. The only thing I would see different is the golden accents be painted to black, the golden plastic accents make this look like a children's toy. I love ninja swords, although not historically accurate the short blade, square tsuba, and regular length handle this piece offers, screams Ninja and thats why I bought it. I feel that this price is just right for what you get, another $10-$15 I would most defiantly expect some changes like a higher quality ito (handle wrapping).